Dolphin 9500 & 9550 with Microsoft® Pocket PC HHP introduces the Dolphin 9500 & 9550 . 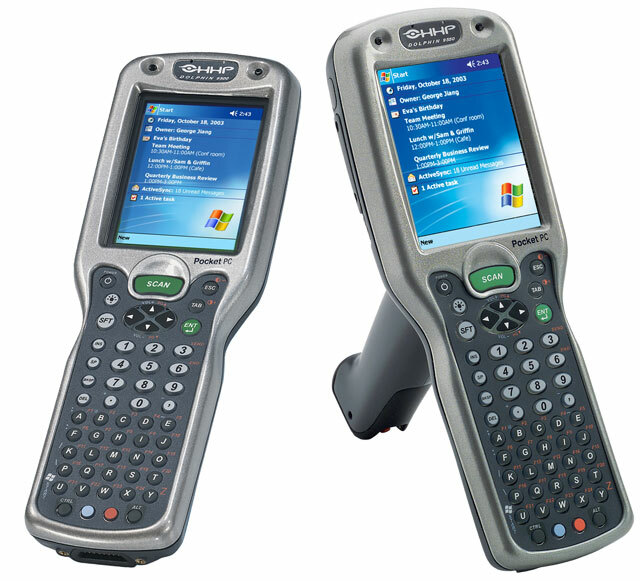 More powerful and rugged than any portable computing device available, the new Dolphin 9500 & 9550 mobile computers significantly raise the bar in the field of mobile data collection. Featuring the very best in area imaging and communications technologies, these ultra-powerful, compact devices are lighter and smaller than their predecessors. Use them to quickly scan traditional and specialty barcodes, photograph freight deliveries, alert drivers to unscheduled deliveries or pick ups, capture signatures and more. Because of its powerful battery pack, the Dolphin 9500 & 9550 ensures full-shift operation- even in WLAN and barcode read-intensive environments. Best of all, its small and slim enough to operate with just one hand, but rugged enough to withstand the roughest application environments. For maximum speed, efficiency, and usability, the Dolphin 9500 & 9550 comes equipped with the Intel X-Scale processor and the Microsoft (R) Pocket PC platform. Supporting an industry leading integrated triple-radio design with wireless WAN, LAN, and PAN the Dolphin 9500 & 9550 allows real-time data collection and anywhere, anytime information access. The Dolphin 9500 & 9550 also has a full line of peripherals that include a charging and communication cradle, an mobile cradle, a multi-slot Ethernet cradle, and a multi-slot battery charger.